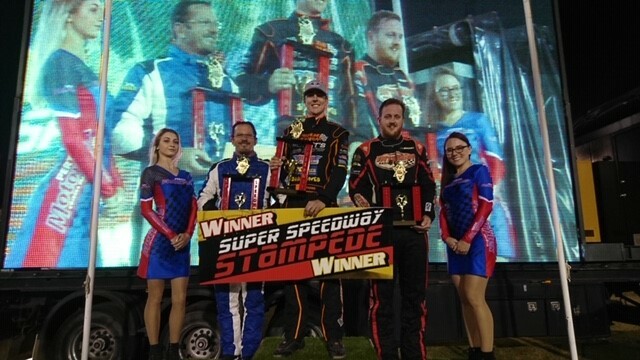 For the second time in as many weeks the Late Models have put in a blinding feature race to steal the show at the Perth Motorplex, but this time it was Kye Blight who took home the win. Although Blight was the man who claimed pole position, Ryan Halliday got the jump on the initial start, with Marc Giancola quickly moving into second place as Blight just didn’t get to race pace quickly enough and dropped right back through the field. With one lap complete the yellow lights came on as Jamie Moon and Michael Holmes made contact, Holmes spinning and coming to a stop. Moon was sent to the rear for the contact, with drivers lining up for a Delaware restart, with Halliday leading from the front alone and the rest of the field behind. Halliday made the most of the restart and raced away as Blight too began to pick his way back through the field, moving into fifth place after just one more lap was completed. Halliday would lead Giancola, Jay Cardy, Paul Stubber and Blight, but on lap five Cardy would go high and clout the turn four wall, dropping him back to fifth. On lap six the make up of the race changed, with Halliday slowing suddenly and heading infield as once again Marc Giancola and Paul Stubber came together while fighting for the lead, the third time in three rounds the duo have continued their rivalry. This time, as happened in the previous two rounds, Stubber would spin and like the last meeting, he would continue on without bringing out the yellows. The top five now looked different, with Giancola leading Blight, Cardy, Blake and Stubber, with Blight piling the pressure on Giancola, the two making contact and sparks flying from Blight as he scraped the fence looking for a way through. Giancola, Blight and Cardy were now clear of the rest of the field, with lapped traffic beginning to play its part on lay eleven. Blight shifted to the lowline and it paid dividends almost immediately, drawing alongside Giancola for the lead, but again Giancola was too good as he maintained the lead, while fourth placed Stubber and fifth place Blake would close the gap again. Unfortunately, the commentators and the stewards spoke to soon, both groups of people commenting on Stubber who was closing the gap at a rate of knots, before he went up in a ball of fire and smoke, heading infield, his race over. Back up front Giancola was holding off Blight, Cardy and Blake, while all through the field were intense battles for every position, so tight was the race. Giancola and Blight would start to build a gap over Cardy on lap eighteen, then two laps later Blight simply swept past Giancola and began to pull away as Cardy too went to pass Giancola in lapped traffic. Again though, Giancola would hold position. By this time, Blight built up a massive gap in just a few laps, in fact lapping up to sixth place on lap twenty five. Giancola too opened up a gap on Cardy. 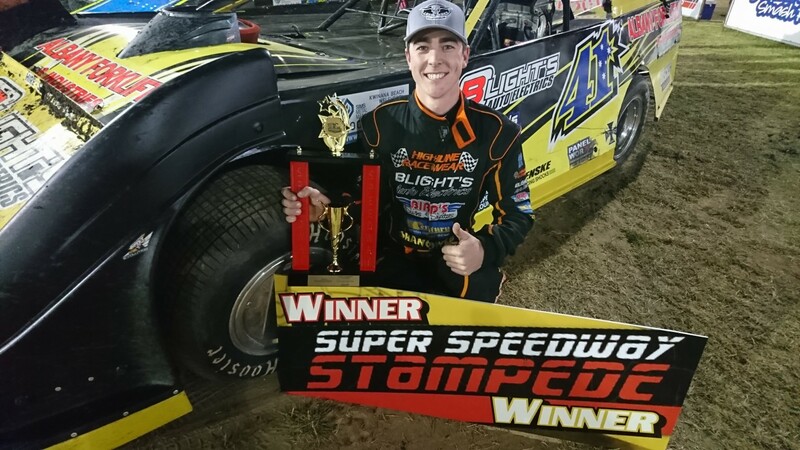 In the final corners Blight had a half lose but it didn’t matter, as he went to claim the win from Giancola and Cardy in what was another epic show, demonstrating why Late Models are the most exciting division of Speedway! Late Models will now have a fortnights break before returning to action, once again at the Perth Motorplex on the 17th of November. This will be the annual King of Kwinana event, doubling as round four of the Sims Metal Management Pro Dirt Series. The Sims Metal Management Late Model Pro Dirt Series and Di Candilo Steel City Invasion Tour, proudly bought to you by Global XLI, Boyes Mechanical, Cardy Racing Components, Dirt Track Nutters, Pancho’s Mexican Restaurants, APM Roofing, RACIN, Collie Machine Shop, Grays Online, Mac Track, Rockingham Towing, Rockingham Pharmacy, Mezzstor, Palice Property Group, Michael Holmes Racing, West Coast Big Bike Hire, Our Car Autos, QB Metal Recyclers and Bulk Metals. Heat One, 8 laps: 1. 41 Kye Blight, 2. 99 Ryan Halliday, 3. 91 Michael Holmes, 4. 26 Ken Macpherson, 5. 0 Brad Blake, 6. 19 Simon McNab, 7. 95 Jason Bond, 8. 14 Willy Powell, 9. 75 Mick Comley (7). DNF: 318 Freddy Kinsella (6). Total Time: No Time. Winning Margin: Not Available. Fastest Lap: 16.509 Ryan Halliday. Heat Two, 8 laps: 1. 31 Paul Stubber, 2. 52 Jay Cardy, 3. 83 Daniel Ameduri, 4. 43 Marc Giancola, 5. 50 Veronica McCann, 6. 71 Jamie Moon, 7. 23 Joe Chalmers. Total Time: 2.15.535. Winning Margin: 1.885. Fastest Lap: 16.493 Jay Cardy. Heat Three, 8 laps: 1. 43 Marc Giancola, 2. 41 Kye Blight, 3. 26 Ken Macpherson, 4. 50 Veronica McCann, 5. 71 Jamie Moon, 6. 19 Simon McNab. DNF: 95 Jason Bond (6), 318 Freddy Kinsella (6). Total Time: No Time. Winning Margin: 1.391. Fastest Lap: 16.276 Marc Giancola. Heat Four, 8 laps: 1. 0 Brad Blake, 2. 99 Ryan Halliday, 3. 52 Jay Cardy, 4. 31 Paul Stubber, 5. 23 Joe Chalmers, 6. 91 Michael Holmes, 7. 83 Daniel Ameduri, 8. 75 Mick Comley, 9. 14 Willy Powell. Total Time: 2.14.652. Winning Margin: 0.413. Fastest Lap: 16.611 Ryan Halliday. Feature, 30 laps: 1. 41 Kye Blight, 2. 43 Marc Giancola, 3. 52 Jay Cardy, 4. 0 Brad Blake, 5. 83 Daniel Ameduri, 6. 23 Joe Chalmers (29), 7. 50 Veronica McCann (29), 8. 91 Michael Holmes (29), 9. 19 Simon McNab (29), 10. 75 Mick Comley (29), 11. 26 Ken Macpherson (29), 12. 14 Willy Powell (28), 13. 318 Freddy Kinsella (28). DNF: 71 Jamie Moon (27), 31 Paul Stubber (13), 99 Ryan Halliday (7). DNS: 95 Jason Bond. Total Time: No Time. Winning Margin: 5.797. Fastest Lap: 16.293 Ryan Halliday.